Hanoi (VNS/VNA) - Artworks by children with autism have gone on display at an exhibition to mark the World Autism Awareness Day (April 2). The exhibition Infinity Joy displays paintings and installation arts created by autistic children from a special art class of To He Fun, a company which creates artistic playgrounds for handicapped children and orphans, aiming to nurture their confidence and creativity. It’s a part of a campaign to explore the world of autistic children. 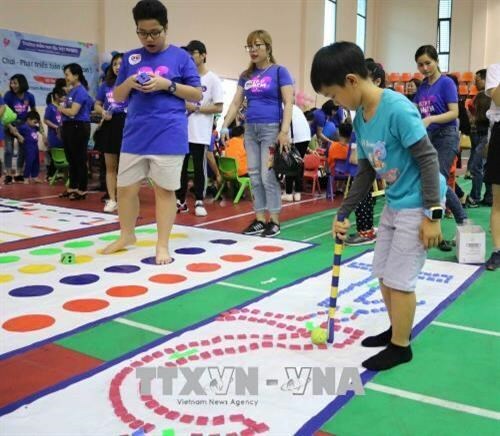 “Through the campaign, we want people to understand more about the different worlds of the special children as well as their positive energy,” said coordinator of To He Fun Nguyen Thi Quynh Hoa. The exhibition showcases artworks by Van Minh Duc, Pham Binh Minh, Lee Nguyen Sahae, Hoang Phuc Dat and other children from Sao Mai and Tottochan centres for autistic children. They were instructed and supervised by visual artist Nguyen Thu Ha. Apart from the exhibition, a workshop on education for autistic children will take place on April 12 with educator Nguyen Thi Nha Trang. A workshop on dancing therapy for autistic children with artist Bui Tuyet Minh will take place on April 21.